This spring and summer, PONSHOP is offering workshops for children and adults in: Ceramics, Skateboard Graphics, Street Art, Collage and more! We now offer classes in Video and Film Making, Jewelry Design, and Stitching plush toys! New this season is a Clay and Paint Combo Workshop on April 22 and August 18. Get the best of both Art Worlds with PONSHOP owners Scarlett and Gabriel Pons in this exclusive double-header class. If you've already taken a series of classes with us and want to continue your project, simply take an additional class and pay per session. Our Summer Camp Format of consecutive daily classes begins June 24 with Skate to Create. Below are examples from our student workshops. Creature Feature, taught by Leslie Brier, incorporates collage techniques and found objects create a creature sculpture that expresses their style. Make your own "Snuggle Monster" with Ashleigh Burbidge this spring and summer. Students learn basic needle threading and stitching to make their own cute creature ($30 for one 1.5 hour session). You can view more photos from our past Summer Class Sessions Here. Click Here for our full schedule and Registration Form. Adult Clay Class (Instructor: Scarlett Pons) Students use a variety of hand building techniques for sculptural or functional pieces. Children's Clay Class (Instructor: Scarlett Pons) Kid's learn a variety of hand-building techniques with clay. Children's Drawing Workshop (Instructor: Gabriel Pons) Using pencils, markers, and more, kid's explore drawing as a way of seeing their world. Skate to Create (Instructor: Gabriel Pons) Design and Paint your own skateboard deck using stencils and spray paint. Intro to Street Art (Instructor: Gabriel Pons) Students create large format graphics using stencils, spray paint, markers and more. Adult Stencil and Mixed Media (Instructor: Gabriel Pons) learn a variety of media techniques using collage, acrylic and paper stencils. My Recycled Room (Instructor: Leslie Brier): Students can transform excess junk and clutter into fun works of art to decorate their own space. Creature Feature (Instructor: Leslie Brier): Applying collage techniques to found objects allows students to create a creature sculpture that expresses their style and creativity. Steampunk Art Doll (Instructor: Leslie Brier): Use a wooden drawing model and some found objects or hardware to create an artistic steampunk styled figure. 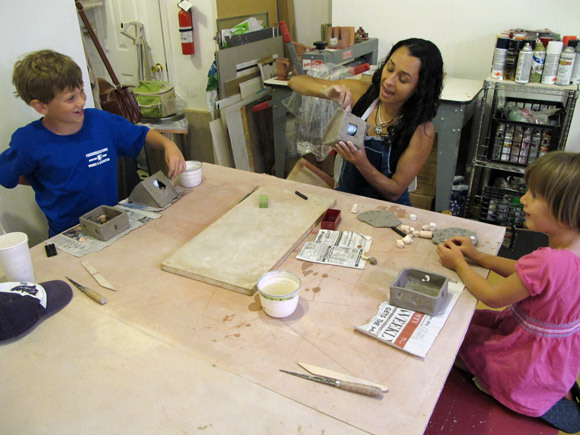 Learn the art of hand-building in our Children's Clay Classes. After only a few sessions with Scarlett Pons, these children were able to create their very own ceramic pieces and finish them with an under-glaze. Check out our class schedule and sign up now to reserve your seat!